DUNCAN – Some Greenlee County farmers said they may lose their land unless they can resolve a water-rights dispute that could cut off their water supply. “Our money only goes so far when you’re fighting the United States of America,” one farmer said. However, the Native American tribe that holds rights to the water said they’re simply protecting their resources. In October 2013, lawyers representing the Gila River Indian Community sent letters to some local farmers telling them to discontinue watering their land from their wells. A federal decree forbids certain landowners in that area from using well water without approval from federal district courts. Janette and Ray Tyler, who own Tyler Farms, said their livelihood depends on the success of their farm. The Tyler family has 340 acres of farmland. The letter claimed the farm was “not in compliance” with the decree, and they were given 30 days to comply. One of the farmers turned a large portion of his farmland into a grass field that depends on rain since he stopped using water from his well. Officials from the Gila River Indian Community said enforcing the decree would help river preservation and protect its water resources for future use. The Gila River community has spent years working to regain water rights that farmers have violated, officials said. Native American tribes play a critical role in protecting water resources on their land, said Gov. Stephen Roe Lewis of the Gila River Indian Community said. However, the situation is not black and white. Attorneys for the Gila River Indian Community said farmers drilling for water could get water from the Gila River itself. But determining the difference between river water and well water is tricky. Greenlee County Supervisor Robert Corbell said he’s reached out to the parties involved in the decree, but they have not been able to give him any information about how they determine well water from river water. He said he’s worried the legal battle will harm the rural lifestyle and local economy. “If these (farmers) go out of business, it’s not only them effected – it’s the truckers, it’s the gas that’s bought … the prices for food go up,” Corbell said. Janette, who grew up on the farm, said it’s hard to understand why her water usage is suddenly an issue. 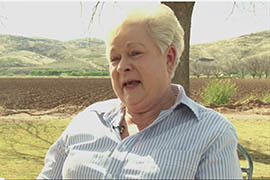 The state issued permits to Janette’s father to build wells when they bought the property decades ago. Frustrated, she said if the actions were illegal back then, why was her father given permits in the first place? However, the issue is a federal matter. Lewis said the Indian community does not want to shut off resources forever. Eventually, the tribe wants to provide water to surrounding communities and create a business relationship so both communities can benefit, Lewis said. “We were the breadbasket of the region historically, and we want to be the breadbasket of the region in the future,” Lewis said. A dispute over water rights could mean the end for some small farms in remote Greenlee County in eastern Arizona. The Gila River Indian Community says the farms are tapping into the watershed at the expense of the reservation's water rights.